year on year increase of 14% in volume and 25% in value. metre, a year on year increase of 9%. cubic metre, up 8% on the same period of 2017. 5% on the same period of 2017. 22% in volume and 28% in value. per cubic metre, up 5% on the same period of 2017.
decrease of 1% was recorded for log imports from Russia. cubic metre in the first quarter of 2018. 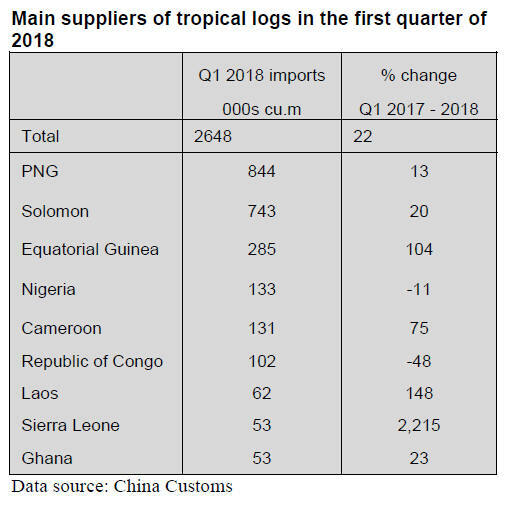 Guinea surged in the first quarter of 2018 respectively. US$288 per cubic metre, a year on year increase of 10%. 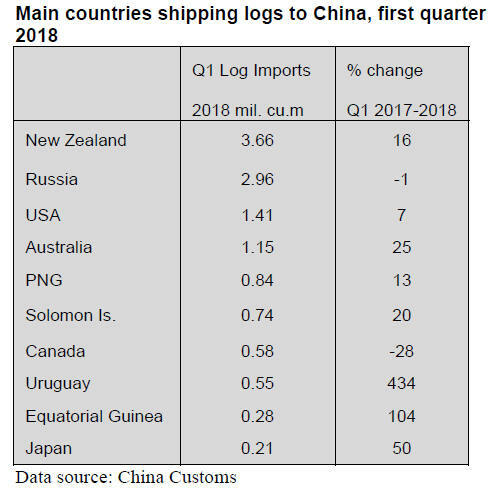 the same period of 2017.
metres (35% of the national total sawn hardwood imports). 7% on the same period of 2017.
cubic metre, up 7% on the same period of 2017. US$395 per cubic metre, a year on year increase of 7%. for the compilation of the China Timber Price Index. development of the new railway.